Stanley Gordon H Donovan was 22 and an orchardist when he enlisted. He was probably living with his aunt Bessie Pittard in Upper Beaconsfield. He embarked from Melbourne on board HMAT 54 Runic on 20 Jun 1916 with the 38th Battalion, D Company. There were 3 more lads from Upper Beaconsfield on the same ship, Edward Dineley, Claud Harris and Lionel Smith. SERN 1154. He returned to Australia on 26 Sep 1917. [S19] Newspaper - Berwick Shire News and Pakenham and Cranbourne Gazette "23 Feb 1916, p2." [S80] Ancestry - Family Tree, Timothy Crutchett - Crutchett Family Tree. [S185] Property Titles. ; PROV (Public Records Office Victoria), C/T 3514-722 - The President Councillors and Ratepayers of the Shire of Berwick - C/T 3882-330. [S22] Victorian Government. BDM Index Victoria (online) "Death entry #D4089 - gives place of birth as New South Wales." [S185] Property Titles. ; PROV (Public Records Office Victoria), C/T 3514-722 - James Donaldson died on 18th May 1939. Probate of his will has been granted to Helen Davidson Donaldson of 25 Centre Road East Brighton Widow. [S185] Property Titles. ; PROV (Public Records Office Victoria), C/T 3514-722 - Ernest James Griffiths of Gembrook Road Upper Pakenham Farmer - C/T 6478-560. [S108] Electoral Roll for Australia, 1908 "as Ellen Davidson DONALDSON." [S22] Victorian Government. BDM Index Victoria (online) "Death of father: #D2731/1883 (Age 64) spouse Rose BURNS [par Donald Samuel DONALDSON & Unknown]." [S22] Victorian Government. BDM Index Victoria (online) "Death of mother: #D8263/1896 (Age 77) parents unknown." [S1] Registry of Births Deaths and Marriages Pioneer Index Victoria 1836-1888 "no birth registration found in Victoria." [S80] Ancestry - Family Tree, Ancestral Trails - Owner: Chris O'Sullivan gives birth place as Moranding VIC on 3 Sep 1860. [S11] Newspaper - Argus 20 Feb 1947, p2. [S5] Registry of Births Deaths and Marriages Death Index Victoria 1921-1985 "[par James DONALDSON & Helen]." Avenel William John Donaldson, a farmer, aged 28, enlisted on 11 Mar 1917 with the Camel Corp, May 1917 Reinforcements. His unit embarked from Sydney on board HMAT A55 Kyarra on 3 Sep 1917. SERN 3283. The Camel Corp was later incorporated in the 14th Light Horse Regiment. While he served in Egypt where he suffered from mumps and psoriasis. He was promoted to Corporal and was awarded a Military Medal on 17 Oct 1918 for bravery in the field in Palestine. His citation reads: 3283 Tpr. Donaldson, A., 14th Aust. L.H.R. (EGYPT). 3283 Tpr. Donaldson, A., 14th Aust. L.H.R. (EGYPT). [S206] Website Australian War Memorial (http://www.awm.gov.au) "http://www.awm.gov.au/units/unit_10575.asp." [S80] Ancestry - Family Tree, Chalmers & Meacham Owner: Rmault155. 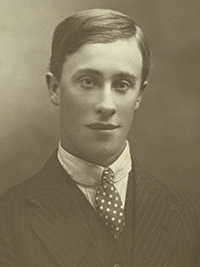 Montrose Richard Ferguson Donaldson aged 23 and a labourer, enlisted on 16 Jul 1915. He embarked from Melbourne on board HMAT A73 Commonwealth on 26 Nov 1915 with the 23rd Battalion 7th Reinforcement. SERN 3088. He served in Egypt and on the Western Front. He was transferred to the 59th Battalion where he was shot in the leg at Weimereux in July 1916. Upon recovery he joined the 5th Machine Gun Battalion, probably at their Depot. He was sick in hospital with psoriasis, and was gassed on at least two occasions. He returned to Australia on 8 May 1919. [S11] Newspaper - Argus 13 Aug 1951, p15. [S185] Property Titles. ; PROV (Public Records Office Victoria), C/T 1403-542 - Bryan Foster of Beaconsfield Pensioner - C/T 5802-255. [S16] Newspaper - The Age The Age (Melbourne, Vic. : 1854 - 1954), Fri 14 Mar 1947, p7. [S218] Newspaper - The Dandenong Journal (1927-1954) "The Dandenong Journal (Vic. : 1927 - 1954), Wed 19 Mar 1947, p5." [S65] Ancestry - various indices, 1881 census RG11; Piece: 4288; Folio: 27; Page: 53; GSU roll: 1342024. [S16] Newspaper - The Age 4 Apr 1921, p1. William Henry Foster enlisted on 28 Oct 1914 when he was 21 years old and a stoker. He is also recorded as a team driver. He married his girlfriend shortly before he embarked from Melbourne on 2 Feb 1915 on board HMAT A46 Clan Macgillivray with the 14th Battalion 2nd Reinforcement. SERN 1450/1552. He returned to Australia on 11 Apr 1916, because of heart trouble and rheumatism. Note* 12 Mar 1916 Six years ago at the age of 17 years he got a heart strain doing heavy work, firing big boilers, was then advised to go to Australia, which he did, doing mostly team driving there. Says he was 13 stone on enlistment now 11 stone, gets shortness of breath and dizziness on excertion also precordial pain. Last year was evacuated to England for rheumatism + VDH. Some days after returning from England fainted here in Egypt and was sent here. [S185] Property Titles. ; PROV (Public Records Office Victoria), C/T 3689-782 - William Henry Foster of Beaconsfield Labourer. [S185] Property Titles. ; PROV (Public Records Office Victoria), C/T 3689-782 - Jane Kelsall of 35 Armadale Street Armadale Married Woman. [S35] Probate Records, PROV (Public Records Office Victoria), VPRS 28/P13, unit 220; VPRS 7591/P9, unit 45. [S83] Online index to the UK census "Class: RG14; Piece: 9999; Schedule Number: 72." Sir, In reply to your letter of the 18th inst. I have the honor to state that I complied with the regulations by fencing and sowing with Eng. grasses, the same as my neighbour Mr A May who has purchased his selection, and others (with the exception that Mr Brisbane conducted his application). My selection can only be reached on foot till the roads are cleared of fallen timber and crossings made. The ground is of such poor description that I doubt that even grass will grow on it, except in patches on the low-lying portions. Reply to letter of 18th inst Corr No 819 49 Survey Dist. Sir, Having had no reply to my letter of the 29th July (in which I answered your's of 18th same month) I cannot understand how there could be any objection to having my block put up for sale, when Messrs May, Mitchell and McIvor have got theirs, and I have done all that they have. By referring to the plan of Pakenham you will see that I had a great deal more fencing to pay for than either of the above gentlemen, and I may state that it was fenced by the same man who did theirs. I paid at the same rate as they did, and I have done everything that they have done, and along with them, and I cannot see why there can be any distinction made, unless in my favor, as my fencing cost me more than either of theirs. An early answer will oblige. Death-Notice* 26 Jun 1905 ROBERTSON.-On the 24th June, at his residence, 118 Lonsdale-street, Melbourne, John Robertson formerly of Perth, Scotland), aged 74 years. A colonist of 48 years. Home papers please copy. The Friends of the late Mr. JOHN ROBERTSON are respectfully invited to follow his remains to the place of interment, Melbourne General Cemetery. The funeral will leave his late residence, 118 Lonsdale-street, Melbourne, To-morrow (Tuesday, 27th June ), at 3 o'clock. also his wife Isabella died 14 Sep 1881 age 42 yrs. Right. Also David ROBERTSON died 27 Nov 1880 age 41 yrs ; Betsy ROBINSON died 23 Jan 1876 age 35 yrs. 819/49 JOHN ROBERTSON PAKENHAM 103 18--3--21. 1876 - 1879. [S185] Property Titles. ; PROV (Public Records Office Victoria), C/T 1162-299 - John Robertson of Melbourne. [S11] Newspaper - Argus 26 Jun 1905, p1. [S35] Probate Records, PROV (Public Records Office Victoria), no title number given. [S185] Property Titles. ; PROV (Public Records Office Victoria), C/T 1162-299 - Memo No 35525. Harry Emmerton of Raveloe, Domain Road, South Yarra, Solicitor and Thomas Bogue Atkinson of Duke Street, Abbotsford Gentleman, are registered proprietors of the within-described land as Executors to whom probate of the Will and codicil of John Robertson (who died 24th June, 1905) was granted the 15th August, 1905. [S22] Victorian Government. BDM Index Victoria (online) "Thos Bogue ATKINSON #D13011/1915 (Age 68) [par Thos Bogue ATKINSON & Elizabeth SWIGGE] died Collingwood." [S185] Property Titles. ; PROV (Public Records Office Victoria), C/T 1162-299 - Red Ink No 1853810. Harry Emmerton the survivor of the proprietors named herein is, by the direction of the Commissioner of Titles given under section 268 of the Transfer of Land Act 1915, now registered as sole proprietor of the within described estate. [S20] Various indexed records of GSV - Genealogical Society Victoria "Govt Gazette Index." Death-Notice* 8 May 1918 STUBBS.-On the 6th May, Catherine, dearly beloved wife of Edward Stubbs, of 113 Beaconsfield parade, Albert Park, beloved mother of Edward G. and Frank S. Stubbs, and Mrs. E. J. Robinson. Privately interred. Probate (Will)* 13 Jul 1918 Catherine Stubbs. Baths Propr. Albert Park. 6 May 1918. 159/282. [S185] Property Titles. ; PROV (Public Records Office Victoria), C/T 2323-590 - Catherine Stubbs of Beaconsfield Parade South Melbourne, wife of Edward Stubbs of the same place Gentleman. [S185] Property Titles. ; PROV (Public Records Office Victoria), C/T 1750-966 (D-39) - The English Scottish + Australian Bank Limited to Catherine Stubbs of 71 Beaconsfield Parade Albert Park Married Woman. [S185] Property Titles. ; PROV (Public Records Office Victoria), C/T 1750-965 (D-38) - The English Scottish + Australian Bank Limited to Catherine Stubbs of 71 Beaconsfield Parade Albert Park Married Woman - this mortgage was discharged when land was sold to Catherine Stubbs. [S185] Property Titles. ; PROV (Public Records Office Victoria), C/T 1750-965 and 966 - Catherine Stubbs to Christine Maybelle Drake of Upper Beaconsfield the wife of William Elliot Drake. [S185] Property Titles. ; PROV (Public Records Office Victoria), C/T 2323-590 - Christine Maybelle Drake of Upper Beaconsfield the wife of William Elliot Drake. [S11] Newspaper - Argus 8 May 1918, p1. [S35] Probate Records, PROV (Public Records Office Victoria), VPRS 28/P3, unit 847; VPRS 7591/P2, unit 587.